After a jam-packed night hosting and performing on SNL with new material, Donald Glover dropped a spectacular and timely new visual, as Childish Gambino, for his return track “This is America” on Saturday night. In the video, we witness a slightly unhinged Gambino tackle the latest dance crazes as children dance and scatter around him in a chaotic parking lot that is no doubt meant to symbolise the nation of America. During the course of the video, we follow Gambino from space to space as he shoots a masked guitarist, mows down a church choir with a machine gun, and dances hard in between, before lighting up a joint and climbing onto a car for the final scenes. The video ends chillingly, with Gambino subsequently being chased through the dark. The final shot shows the fear flicker in his eyes as he strides to outrun the violent mob. Directed by Glover’s longtime collaborator and Atlanta director Hiro Murai, there is so much to unpack in the visual beyond Gambino’s own erratic and brilliant performance. 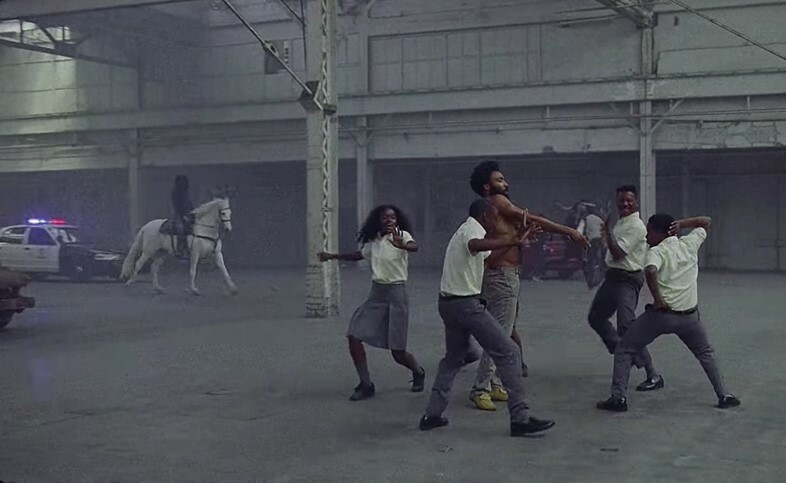 Arguably, the focus of the video is to illustrate just how easily we are distracted from the abhorrent truths of our society, when presented with the spectacle of pop culture through dance moves and viral content, just as Gambino’s dance moves distract us from the chaos constantly unfolding behind him. Here’s a breakdown of some of the most powerful elements of the video. The most immediate feature of the video is the gun. By displaying the violence of the weapon so openly in the first scene, we are thrown into a state of shock from the get go – but the commentary goes further than that. Every time Childish executes someone with the weapon, a child rushes in to collect the firearm and carefully place it into a cloth before removing it from the scene. Conversely, when Childish Gambino shoots the first victim, the body is dragged from the scene as he walks on unstirred, while the church choir are left as a pile of bodies in disarray. Here, the disconnect between the care with which the gun is treated, in direct contrast with the blatant disregard for human life is both jarring and palpable; impossible to look away from. This is America. It’s also been suggested that the pose Gambino pulls before shooting his first victim, played by artist Calvin the Second, is a reference to Jim Crow, a theatrical racist black stereotype created in the 19th century. The name was later used as the name for racial segregation laws in the US, before evolving once again into a term to describe the politics of mass incarceration in America by Michelle Alexander, author of The New Jim Crow. Alongside the performative element of the video and the range of dramatic facial expressions pulled by Childish Gambino, he could be seen to embody different stereotypes throughout the video: from the violent aggressor, to the entertainer, to the hunted. The inclusion of a choir as the targets of Gambino’s sinister rampage has huge symbolism here. When we find the choir, they are actually sectioned off in a room removed from the commotion, somewhat innocently providing backing vocals for the track. Gambino enters the room innocuously and dances along before quickly becoming disinterested and murdering the members within seconds. As he exits the scene scot-free, crowds from the parking lot rush in the opposite direction and populate the once-quiet room. The choir here likely makes reference to the particular menace of church shootings, such as those in Charleston and Sutherland Springs, as well as the vulnerable presence of religion within black communities. Throughout the video, Childish Gambino and his youthful entourage use dance as a distraction from the brutality unfolding around them. This can be seen as a reflection of how we live and function in online spaces in 2018. The forums we use allow two opposing forces – of joy and horror – to coexist, as spectacles of black death and viral memes fill our feeds interchangeably. As Gambino rattles off the lyrics “hunnid bands, hunnid bands, hunnid bands, contraband, contraband, contraband”, he demonstrates a hip hop trope of drugs, money, and the pursuit of superficial success as a distraction topic from the real oppression and violence taking place on the ground. While we watch the dancers in the foreground, scenarios of police brutality and rioting play out in the background. If you blink, you might miss a car on fire or a hooded figure riding across the screen on a white horse – thought to symbolise one of the Four Horsemen of the Apocalypse, Death. In true Black Mirror style, as the camera pans between shots, we also catch a glimpse of a few teens recording the events on their phones from a safe distance. In this way, pop culture content is (and always has been) both a subconscious smoke screen and a conscious coping mechanism for many. Choreographed by Sherrie Silver, an African dance teacher and choreographer, the dancing itself has layers to it. Spanning across continents, Gambino and the children cover moves like ‘Shoot’, made viral by Memphis rapper Blocboy JB’s tune with Drake, ‘Look Alive’, all the way to the ‘Gwara Gwara’ a South African dance move gaining popularity worldwide (and performed by Rihanna at this year’s Grammys). This choice feels deliberate, giving the commentary global scale. The new release contains many low-key collaborations with other artists, featuring ad libs and backing vocals from Blocboy JB, Young Thug, 21 Savage, Slim Jxmmi, and Quavo. Most strikingly, SZA makes a cameo leaning on a car after the chaos seems to have subsided. On Instagram, she later posted a picture of her from the shoot that suggests she was embodying a Lady Liberty watching on passively. The visual message is a clear comment on America’s hypocritical, poisonous rhetoric of ‘freedom’, while it abuses and silences the marginalised members of society.